The Adonis Stevenson and Badou Jack fight on Saturday, May 19 brought everything and then some to 12 Championships rounds. With linear world championship on the line and no clear champion emerging, the judges ruled a majority draw Stevenson retained his WBC belt live on SHOWTIME from Air Canada Centre in Toronto. 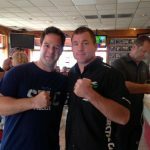 Ryan Sprague is live in Toronto for live results and updates of the fight between Stevenson and Jack. The card will also feature WBC Featherweight Championship bout between Gary Russel Jr. and Joseph Diaz Jr.